This article demonstrates how to integrate "Log in using Google account" functionality to your web application. There are many ways to integrate it. Here, I will explain how to integrate using REST API. Before you can integrate Google Sign-In into your website, you must create a Google API Console project and client ID, which you need to call the sign-in API. To create a project, follow the below steps. Click on "OAuth consent screen" and enter necessary details followed by clicking on "Save" option. Now, go to the "Credentials" section and click on "Create Credential" button. Enter Authorized redirect URL. This URL should be your app API which will capture the access code or error code returned from Google API as a parameter. Then, click on Create button. On the next page, you will be provided with a "Client Id" and "Client Secret key". Save these values separately. We will use these keys later in our web application to validate our request. Now your app is ready to use. Now, we will test this functionality using an ASP.NET MVC application (.NET Framework). Create an MVC project using VisualStudio IDE. Add Newtonsoft.JSON library from NuGet Package Manager to your project. This library will be used to serialize and deserialize JSON object. Add System.Net.Http assembly using "Add a reference" option. This will be used to request URLs using HttpClient class instance. Add a Controller named Home and add the following code. Add a Models folder and add the following models. These models will be used to store the information received from Google API. Now, add views for log in page and display user profile. In Web.Config file, add the following configuration. Enter your own Client id and Secret key that you received while creating the key in Google developer portal. https://console.developers.google.com. Run the Project and hit Url: http://localhost:52986/Home/Index and click on "Login using Google" button. Now, the Google API will ask for your permission to grant access to your app. Click on "Allow" button and you will see your basic details on our user profile page. 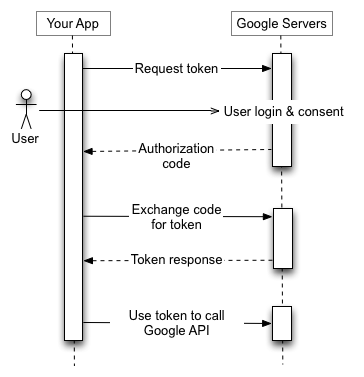 The user data response you will get from Google API will look like this. Our code will deserialize this JSON data into an object named UserProfile. User details page will look like the following one. As the source code is larger than the upload limit, it is first compressed using the 7-Zip compressor and then it is zipped. Please first unzip and then decompress using the 7-Zip software. For any queries and feedback, please write in the comment box. Check "Login using LinkedIn". In an upcoming coming article, I will demonstrate how to integrate "Login using Facebook".